'Mallard', London & North Eastern Railway locomotive no 4468, 1938. 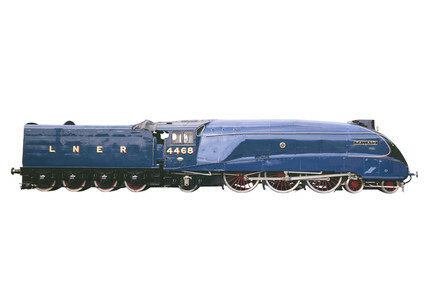 The A4 Pacific clas 'The Mallard' was designed by Sir Nigel Gresley (1876-1941), the chief engineer of the London & North Eastern Railway (LNER). On Sunday 3 July 1938, the 4-6-2 locomotive reached a speed of 126 mph (203 kph) on a straight stretch of track between Grantham and Peterborough, achieving a new world speed record for steam locomotives which remains unbroken to this day.